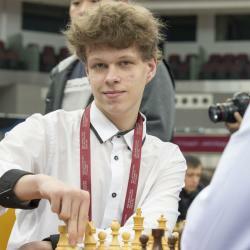 One of the most consistent rises to the top of the chess world by a junior player, Vladislav Artemiev recently became a Grandmaster in 2014. The best U-16 player in the world, Artemiev has really shown that his methodical progress is paying dividends. Also an incredible rapid and blitz player, Artemiev has proved his skill in all three types of time controls for chess and will definitely continue his climb up the rating ladder. Vladislav Artemiev learned to play chess from his father when he was 6 years old. He didn’t play in his first tournament until 2008 when his official rating became 2046. He continued to improve and in 2010 he played in the Vorozezh Masters tournament and played very well, defeating two International Masters and drawing a Grandmaster. Later in 2010 he tied for first at the Petrovskaya Ladya open and in 2011 he came in second place at the Russian U-14 Championship. Throughout the rest of 2011 and beginning of 2012, Artemiev began to acquire his International Master norms and in 2012, before he had turned fourteen, Artemiev became an International Master. By the end of 2012, he crossed the 2500 rating barrier and continued his march forward. In 2013, Artemiev had one of his best tournament results ever when he won the World Youth Stars Tournament with an amazing 10.5/11 points. In 2014 he won the Andranik Margaryan Memorial and also the Moscow Open students division. It was in this year that he earned the Grandmaster title. Artemiev is also a terrific rapid and blitz player, scoring 9.5/11 at the Rapid Grand Prix Novokuznetsk tournament in 2013 and qualifying for the 2013 World Blitz Championship. Recently he has been ranked the number one U-16 chess player in the world and is continuing his ascension to super-Grandmaster status.